In a stunning exposé revealing the truth about the abortion movement, Time Magazine ran a January 2013 cover article titled “Roe v. Wade, They’ve Been Losing Ever Since.” Young women and politicians alike are distancing themselves from the abortion industry and have now even chosen to depart from their cherished cliché—pro-choice. Leftists quickly defined themselves as pro-choice following the passage of Roe v. Wade hoping that the euphemism “choice” would be more palatable than being seen as pro-murder. After all, they reason, abortion is no different than removing a tumor if it is just a fetus! All rational beings have the choice to commit crimes or not, as all men are free to choose; making crime a right is altogether different. Thus, “choice,” this ever-present label used in modern politics, is showing signs of wear. Abortion advocates claim that pro-choice no longer reflects the broad scope of women’s “health” nor do younger women care for the branding. It appears that Planned Parenthood is feeling the foundation of youthful support crumbling beneath their feet as their ranks show only an increased majority of pro-abortion septuagenarians. The pro-choice cliché resonated somewhat well during the 60s and 70s, but it is now falling upon deaf ears. A 2003 CBS/New York Times poll found that 35 percent of young women ages 18 through 29 thought abortions should be available to anyone who wants one, down from 50 percent in a 1993 poll indicating a 15 percent drop in only 10 years. Corresponding to this lack of sympathy for abortion from young women, the total of abortion clinics nationwide has shrunk dramatically. According to the website AbortionDocs.org, the total number of surgical abortion clinics remaining in the country is now 582. That is a 12 percent decrease in surgical abortion clinics in 2013 and a 73 percent drop from a 1991 high of 2,176. As feminists struggle to give plausible answers as to why the steady decline in clinics and the resistance to the abortion movement continues, they fail to see the more profound reasons why pro-choice caught in the first place and what has happened to public opinion since. Liberal optimism thought that it was possible to ride the wave of success indefinitely considering that each successive generation would increasingly favor their cause as morals declined. However, this did not happen. The ferment in public opinion that was evidenced by declining morals by the late sixties indicated an increasing willingness to accept abortion and to throw off all moral restraints. Slogans such as “it’s forbidden to forbid,” “if it feels good do it,” or “do your own thing” summarized the ideology that drove the sixties revolution. Fast forward to the last twenty years and this same rejection of morals has led to blasphemy, public recognition of homosexual “rights” and now the promotion of Satanic worship in public. This moral decay has produced two characteristics in public opinion. One is a reaction among conservatives such as that found in the pro-life movement. The other has been the creation of a profound torpor, apathy toward good and evil evidenced in the general indolence of public opinion in face of the bold advances of the left such as the growth of judicial activism and other liberal advances. Though they have inflicted considerable damage upon the remnants of Christian Civilization, liberals cannot claim but a pyrrhic victory. The combination of a growing resistance coupled with a pervasive torpor in public opinion has seriously undermined liberal activism. The proof can be seen in their aging ranks. Liberal ideas do not appeal to youth any longer; they do not catch fire as they did in the sixties. The only possible victor in the battle for public opinion is on the side that has attractive logical ideals and liberals have lost that banner. The only thing remaining for the left to do is to force their agenda via judicial fiat. They have lost the possibility of winning the war of public opinion through their own doing. They have provoked a huge resistance and created an apathy, which undermines the dynamism of their activists. 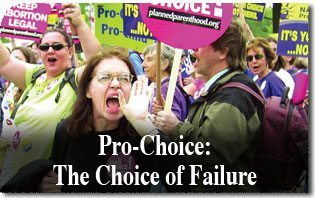 Either way, pro-choice has become the choice of failure.